Develop a virtual Hub that connects the local professional networks of participating partners, facilitating knowledge exchange and pooling of infrastructure. 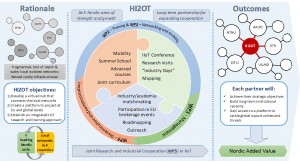 The Hub will provide access to each-other’s professional networks and costly infrastructure (e.g., Smart Factory labs), organize events for experience exchange (e.g., annual conference) and for transfer of knowledge to the industry (research visits and “industry days”), and perform mapping activities (e.g., identifying IIoT Nordic competences). Create a platform from which the partners can more effectively project themselves at EU and global level. The platform will organize: joint participation in EU brokerage events and EU information meetings; joint participation in EU roadmapping activities; industry/academia matchmaking, e.g., jointly targeting SME instruments such as EuroStars; outreach and communication events. HI2OT will organize an International IIoT Conference. Establish an integrated approach to IIoT research and training, bringing together world-class expertise in multiple disciplines. 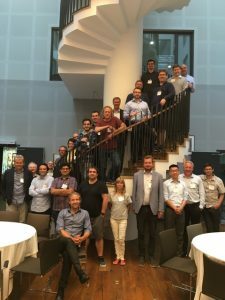 This will be achieved through researcher mobility to promote research collaboration, a Summer School in IIoT, advanced courses dedicated to PhD and MSc students, industrial training courses in IIoT, and the development of an Industrial IoT curriculum to be taught in the Nordic countries’ universities.